What's A Laser Alignment And Why Is It So Important? Rovalution is proud to announce we’re now able to offer laser guided alignment checks in house in a few minutes during your regular service. 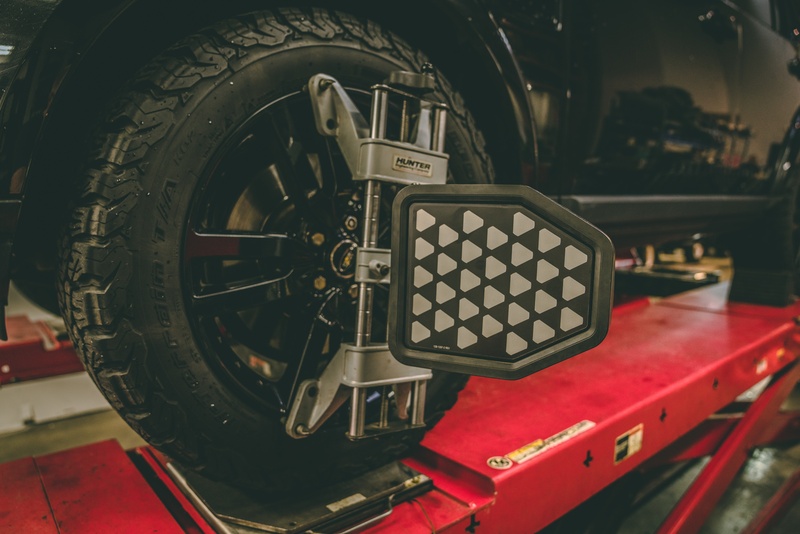 To check the alignment, one of our Land Rover Certified technicians attaches special targets to your car’s wheels and reflects laser light back to the overhead cameras allowing the highly specialized computer system to measure each wheels position, using an overhead projector, to all four. Depending where the beams of light fall on a scale, the technician can see whether the wheels are what adjustments are required to meet the Land Rover Engineered Specifications. Specifications and adjustments are as accurate as hundredths of a degree. For greater accuracy, a computer is used to check the position of the light in relation to the scales. Once the degree of misalignment has been established, completing an alignment is more often than not a short process to adjust the suspension so the wheels are set up correctly, increasing fuel economy and reducing tire wear. This is a measure of how vertical a tire is. If it’s set so that it leans slightly towards the wheel arch it’s described as having negative camber. In the other direction, it’s called positive camber. This is slightly harder to visualise, but concerns how directly above the wheel’s centre the suspension sits and, therefore, how central the angle of the tyre’s placement on the road is on the front to back plane. If you think of a ‘chopper’ style motorcycle with its suspension steeply raked back, this would be an example of extremely positive castor. Wheels that point inwards at the front towards the centre of the car are experiencing toe-in, while if the front of the wheels point outwards towards the road, this is toe-out. How can I tell if my wheels need alignment? Choosing to add an alignment to your Land Rover service is a great value add for your vehicle’s long term health and well being. Small adjustments on the alignment rack can save you thousands of dollars in tire wear and vehicle wear to critical suspension components. A properly aligned Land Rover will also drive better and feel better on, and off road, provide better fuel economy and reduce tire wear.